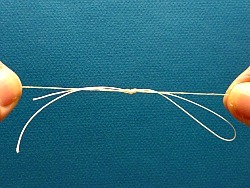 Horsehair lines are the "traditional" tenkara lines. Not nylon, not kevlar, not furled. Horsehair was used as tenkara line for hundreds of years before nylon or kevlar were even invented. The first written account of fly fishing anywhere in the world indicated the line used was horsehair. It has been used as fishing line for thousands of years in various cultures. In some ways it is still the best material. I suspect many people may question that view, but I bet most of them have never fished with it! Horsehair seems to have just the right combination of density and stiffness to make a wonderful tenkara line. By tying together segments made from different numbers of hairs, you can make a line as long as you want and with any taper you want. With modern graphite tenkara rods, you can cast a surprisingly light horsehair line. 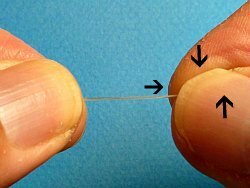 The only source I've seen that reported the number of hairs used to make a tenkara line in Japan indicated a line of five segments, with 5 hairs in the first segment, 6 hairs in the second, and then 7, 8, and 9 hairs in subsequent segments. A line like that would actually work very nicely with the Daiwa Keiryu-X 30, which has been disparaged by some as not being a true tenkara rod. (But if it casts the traditional horsehair line well - and it does - it is probably closer to the traditional tenkara rods than are the modern big name rods of today). For most tenkara rods, I generally start with 3 hairs at the tippet end and do not exceed 5 at the rod end. Horsehair lines even heavier than the traditional Japanese lines are used to this very day by anglers in northern Italy who use a technique called "la pesca a mosca Valsesiana." The Valsesian rods are similar to tenkara rods, although based on the line they use, I suspect they are a bit stiffer. The line used in Italy was described by Yvon Chouinard, the founder of Patagonia, in a wonderful article entitled "Simple Gifts" which was in the October 2009 issue of Fly Rod & Reel magazine. Mr. Chouinard described the line as tapering from 14 or 16 hairs at the rod end down to 3 at the tippet end. The line on the left is made to Charles Cotton's specifications. The line on the right is made to Yvon Chouinard's descripton. Compare that to the line that Charles Cotton specified in The Compleat Angler. 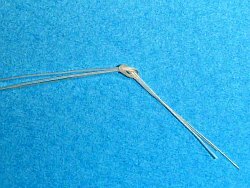 He indicated that the first two lengths nearest the hook should be of two hairs, the next three lengths of three hairs, the next three after that of four hairs, then 5, 6, and 7 hairs up to the length required for the rod. They used longer rods, and much longer lines than are generally used with modern tenkara rods. With a tenkara rod as soft as the Nissin Zerosum or Shimano Keiryu Tenkara 34-38ZL, you only have to go up to four hairs. For a Suntech Kurenai, I wouldn't go over 3 hairs! The full length of the line that Cotton described (up to three lengths of 7 hairs) is up to 34 feet long. For tenkara rods, going up to three lengths of four hairs can create an incredibly light line up to about 16 feet long. Even that is longer than I use. I make my own "Charles Cotton" lines about 13 to 14' by ending the taper at 4 hairs. Most modern anglers believe that Charles Cotton only dapped, and required a breeze from behind in order to blow his line out in front of him. 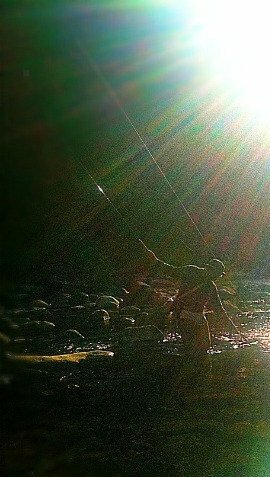 I am certain that view is incorrect, and that he could cast his line and fly very much like tenkara anglers do today. It is true that he could not have cast a line that light into the wind, but on a still day he could have cast anywhere he wanted. When describing the line, he wrote that the taper he specified will "cast your fly to any certain place, to which the hand and eye shall direct it" and also that it will fall "with much less weight and violence, that would otherwise circle the water, and fright away the fish." You definitely do not want to fright away the fish! Having fished with horsehair lines made to his specifications, I will attest that Cotton's line does fall very softly, and the delicacy of the presentation you can get with a light horsehair line is hard to match with a modern line. Charles Cotton's lines are so light, though, that not even all tenkara rods cast them well. They cast well with the Daiwa Expert LL tenkara rods and the Nissin 6:4 tenkara rods (5:5 for the Air Stage Fujiryu) and of course, the TenkaraBum 36 and 40. Although I have not yet tried one on longer keiryu rods like the Suntech Keiryu Sawanobori or Keiryu Special 53, I am sure they would do well with it. Cotton's lines are quite a bit too light for the Daiwa Keiryu-X and the Suntech Genryuko. That's just as well because those rods really aren't soft enough to protect a two-hair line anyway. The line described by Yvon Chouinard, on the other hand, cuts through the wind just as he says in the article but I find it a bit heavy for most tenkara rods. It casts like a bullet with the Keiryu-X, though! For fishing in the wind, or casting four flies as in la pesca moisca a Valsesiana, it actually works quite well with the big water / big fish Daiwa Expert LT H44. By varying the number of hairs in each segment, it is possible to make a line for any tenkara rod - from the softest all the way up to the stiffest. The only problem with horsehair is that it just isn't very strong. Cotton boldly states that he who cannot kill a trout of twenty inches with a line of two hairs does not deserve the name of angler. I guess that leaves me out. I've landed a couple 12" trout on a single-hair tippet, but I've also had a trout that couldn't have gone 8" break a two-hair line when he got into the current and headed downstream. Although Henry Wade (Halcyon: Or, Rod Fishing with Fly Minnow and Worm - 1861) wrote of fishing with a tippet of a single hair and Charles Cotton recommended two, if you fish that fine you are likely to have fish break off. A horsehair line made from more hairs, starting with either 5 hairs at the tippet end, like the historical tenkara lines, or 4 hairs like the pesca mosca a Valsesiana lines, is plenty strong enough for the fish you are likely to catch with a tenkara rod. Even with that limitation, I love the way horsehair casts, and I enjoy working with it to make lines. My lines aren't historically accurate - I don't whip the knot tag ends with silk thread, as David Webster instructed in "The Angler and the Loop Rod." Doing it that way does look nice, but it takes three times as long to make each line. And I don't leave a "straw's breadth" of tag end exposed, as instructed in "Treatyse on Fysshynge wyth an Angle." Doing it that way lets all those tag ends catch the line, your tippet, grass, etc. I cut the tag ends short and coat the knot with flexible glue. I'm not a historian or a historical re-enactor - I just like fishing with horsehair lines. For years I have offered a Horsehair Line Kit, which included a hank of horsehair and all the instructions needed to make a horsehair line. It was reasonably popular and over the years many people have purchased it and made their own lines. I have decided to stop selling the kit and just put the instructions on the website so anyone can make a line without having to purchase a kit. You will have to purchase horsehair, and there are a number of sellers online. When I sold the kit, I purchased the horsehair for the kit from Historic Angling Enterprises. 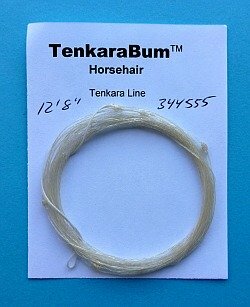 Paul W. Jones, who runs Historic Angling Enterprises still sells horsehair and (at least for now) has some of the TenkaraBum Horsehair Line Kits in stock. If you want the full kit (instructions and hair) contact Paul at historicangling@gmail.com. Making your own line is a bit like tying your own flies. If you remember the satisfaction you felt from catching your first fish on a fly you tied yourself, you'll have that again, and more, when you catch a fish on a line you've made yourself - from scratch - using techniques that have been used for hundreds if not thousands of years. No tools are needed other than a pair of scissors, although a dubbing needle or fly tying bodkin will help in tying the knots and applying flexible cement to keep the knots secure. You don't need a jig like you would to furl lines. You don't need a vise like you would to tie flies. All you need is the horsehair. A thorough search on the internet will give you several ways to make a horsehair line, from the instructions laid out in The Treatyse of Fysshynge wyth an Angle in 1496 on down. None of them are as simple and straightforward as the instructions that follow, and none include photos of each step. Some of the instructions you can find on the internet are for making a knotless line. It is absolutely not necessary to have a knotless line. To the extent possible, a tenkara line should be in the air, not in the water, so picking up debris on the knots really isn’t a problem. If anything, the knots are valuable reference points that aid you in watching for the minor hesitations or twitches that can be the only clue to a subtle strike. Besides, if you break a section, you only have to replace that section, not the whole line. Before you start making your line, you must decide on the length and taper. This decision requires a bit of a compromise because a light line isn't very strong. A line that is strong enough to stand up to any fish you might catch is likely to be heavier than you'd want to fish with. Although I have caught fish up to 12" on a tippet of a single hair, I have also had a fish that couldn't have been larger than 8" break a two-hair line when it got into the current and headed downstream. As a reasonable minimum, I would suggest starting your line with three hairs. (Note: this is for the line itself, to which you will add a nylon or fluorocarbon tippet.) Only once have I broken a three-hair line on a fish. 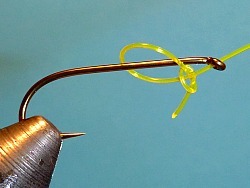 For an average 12’ 7:3 tenkara rod (or the 6:4 Air Stage Fujiryu tenkara rod), I would suggest a line consisting of six segments, with the one to which the tippet is attached having three hairs. The next two would be four hairs each, and the next three 5 hairs each. The 3, 4, 4, 5, 5, 5 sequence (number of hairs per segment) will produce a line that casts like a dream but is a bit on the heavy side for the average rod. An alternative is a line that has one three-hair segment, and then becomes a level line with each segment having 4 hairs. For the softest rods, like the Nissin Royal Stage Syunki, or a Suntech Kurenai, I would not go over 3 hairs.) For the Daiwa Keiryu-X rods, I’d start with 3 hairs and add one hair for each segment until you have enough segments for the length of the rod. Modify the taper on your next line based on how well you like the first. If people's experience with line furling is any guide, you will not stop with one line, so just accept that this will be a process (albeit a process that should eventually produce a line you will really like). 1. Before a hair is selected, you should run it between your thumb and forefinger to feel if it is smooth. Discard any hairs that are rough, any that are noticeably thicker or thinner than the others and any that do not feel round. You can roll them between your thumb and finger – if one isn’t round you’ll feel it. You can often see it as well if there is light shining on it. Press your thumb and forefinger together to create some tension on the hair as you pull it between your thumb and forefinger. 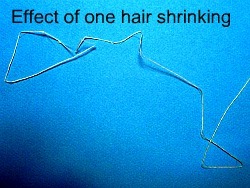 If every hair breaks, you are using too much tension. If none of them break, you aren't using enough tension. If any hair is going to break, you want it to break now. Cut the hair rather than pulling it from the hank. If you pull them out, they’ll start to fall out on their own. 2. If you are right handed, hold the knot between your right thumb and forefinger and the three hairs together, perhaps an inch from the knot, with your left thumb and forefinger. Rub your right thumb and forefinger together to twist the bundle of hairs. You may have to dampen your fingertips if they just slide without twisting the hair. At the same time, pull the hairs through your left thumb and forefinger. How far you pull depends a bit on how much you twist, but use this as a guide: If you start twisting with your fingertip at your thumb tip and end with it at the base of your thumb, pull about 2” of hair from your left hand while you twist. The hairs between your two hands will now look a bit like a 3-ply rope, although the twist won't be that tight. 3. As you twist and pull with your right hand, the three hairs beyond your left hand will each turn individually. It is critical that they be able to turn freely, as it is this turn (twist) of each hair that keeps the three together to make a single line. They will try to tangle up, so after each twist and pull with your right hand, continue to hold the bundle with your left thumb and forefinger, as shown in the photo to the right, while using your right thumb and forefinger to slide down the loose hairs and gently separate them. Do this carefully because if they get caught and a hair gets kinked, it will probably break. 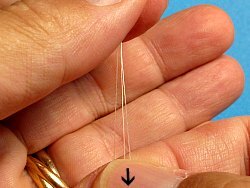 After separating the individual hairs, again grasp the already twisted bundle with your right thumb and forefinger about an inch from your left thumb and forefinger. 4. Repeat the twisting and pulling until you get almost to the end of the strands. When there is about an inch of untwisted hair left, tie an overhand knot in the end of the bundle to keep the strands from untwisting. It does not have to be pulled tight. Overtightening any knot will break hairs. The line segment you have just made is called a "snood." (I don't know why it is called a "snood," but then again, I don't know why it is called a "horse," either.) Repeat the process, and for each new snood, turn half the hairs end for end so that the slight taper in each individual hair is offset by the ones that are turned. After finishing each snood and before starting on the next, I put the newly tied snood in a shallow pan of water. When you have finished the next snood and are ready to put it in the pan, take out the previous one. Occasionally one of the hairs will shrink to the point that you have to discard the snood. Although you can cut off one of the end knots, dry the hair and retwist, I generally just start over. Life is short and hair is cheap. 5. When you have two snoods that have successfully passed the soaking test, tie them together, wetting the knot liberally with saliva before tightening it. 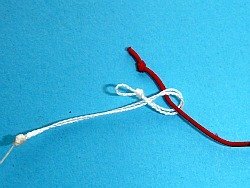 The knot I use is variously called the double surgeons knot, the water knot and the angler’s knot. Unfortunately, other knots are also known by those names. Whatever it is called, to tie the knot I use, overlap the ends of the two snoods by about 3” and tie a simple overhand knot with both snoods at once but pass the ends through the loop twice. It should look like the photo below right, or at least it would if you were joining a black snood to a white one. By the way, I recommend using only white horsehair. I once made a line with brown hair and it was absolutely impossible to see when casting and fishing. The white hair is pretty visible. 6. I find it easier to pull the ends through the loop by using a dubbing needle. 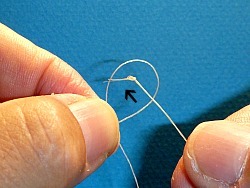 Do not forget to wet the knot before tightening. After you have tightened the knot just past snug, roll the knot between your thumb and forefinger to smooth it out. Then gently pull each of the four line segments coming out of the knot to make sure all are snug. Do not pull too hard to tighten the knot. You can break hairs if you pull to hard. The surface of the hair is just rough enough that the knots tend to hold pretty well. 7. 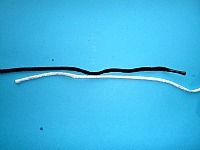 After you have finished the last snood (at the rod end of the line), tie a loop of fly line backing onto the line with a double surgeons knot. Clip the tag ends. 8. 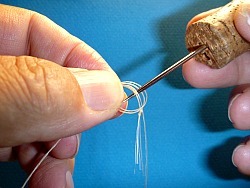 After the tag ends have been cut, tie an overhand knot near the end of the loop. This will give you a bit of line to hold onto and pull with when removing the line from the rod. 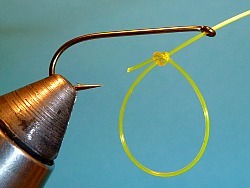 The line is attached to the rod with a girth hitch. 9. 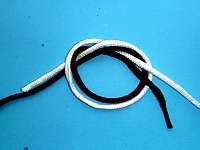 To tie a girth hitch, fold the loop back on itself so that the two strands are caught in the “V” created by the overhand knot. 10. At the end of your tenkara rod is the lillian, which is a short piece of hollow braid. Your rod may have come with an overhand knot tied in the end of the lillian, but if it didn’t tie one in it now. The lillian is inserted into the small loop created by the girth hitch. 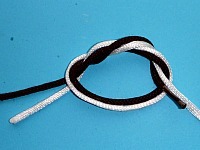 The girth hitch is tightened around the lillian and then slid up tight against the overhand knot in the end of the lillian. Make absolutely sure that you do not put any sideways pressure on the rod tip when attaching or removing the line. To finish the tippet end of the line, I generally tie on a 3-4" length of about 0X or 2X tippet material. 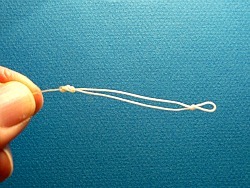 (double surgeon's knot, flexible glue and clipped tag ends.) 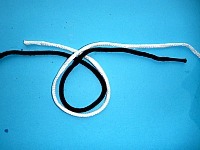 Tie a small perfection loop or other loop knot of your choice or attach a tippet ring to the end of the 0X or 2X. 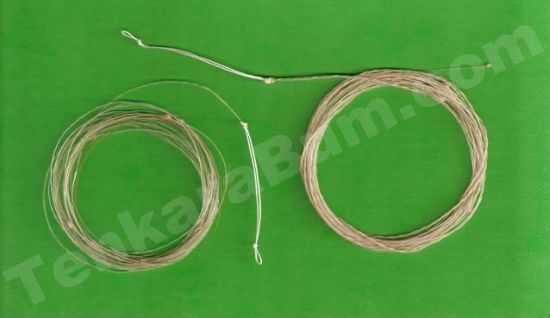 If you are planning to use horsehair tippets, you can tie a double surgeon’s loop in the end of the horsehair line, and in the end of your tippet, and use a loop to loop connection. Perhaps the first thing you will notice when you take your new horsehair line to the stream is that it will have horrendous memory. It will not want to straighten out. Do not stretch the line like you would nylon mono or fluorocarbon. That will only break the line (and it will not get rid of the memory). All you have to do is get the line thoroughly wet and the memory will relax on its own. Much as I have come to like the Fuji EZ Keepers, EZ Keepers and horsehair do not play well together. You will get a kink in the line every place it turns around the EZ Keeper. I do not recommend using EZ Keepers. And definitely do not allow the line to dry while wrapped around EZ Keepers. When you get snags, if at all possible get to a spot where you can pull on the tippet rather than the line or pulling straight back on the rod. If you use 5X tippet you can expect the line to break before your tippet does. With 6X, the tippet might break first, but it might also stretch the line to the point that you have little half moons of line sticking out. I usually fish with 6X and just assume I’ll have to repair lines, but it might be better to fish with 7x (which is why I carry a nice 7X tippet from Varivas). When you get home after a day of fishing, allow the line to air dry. If you seal it in a zip lock envelope with a slip of paper inside telling you length, taper, etc, the line may be fine (the hair is pretty rot resisitant) but the paper will mildew badly. To be safe, don’t seal the envelope until the next day. I generally don’t treat my lines with anything, although I know some people use hair conditioner to try to keep them from drying out too much. Some people also have used Mucilin to help them float. I haven’t heard enough feedback from people to know if either helps the line in the long run. If you fish with your line long enough, you are likely to break it (more likely on a snag than on a fish); Luckily, repairing a line is really pretty simple. Cut the broken hairs right next to the knot connecting the broken snood to the next intact snood. Be sure to leave the knot on the intact snood. Make replacement snoods following the instructions above. Tie the replacement snood (or snoods, although the only breaks I have gotten have been in the last snood next to the tippet) to the intact one, and trim the tag ends as before. You will lose at least an inche in overall length with each repair. You might want to tie a couple extra of the lightest weight snoods for on-stream repairs if necessary. If all that sounds like horsehair lines are delicate and should be in a display case rather than on the end of your rod, all I can say is that I really like the way horsehair lines cast, and even after many attempts, I have not been able to duplicate it with a furled line of any other material. To me it's worth it. This is where you cross the line from practicality to obsession. (I crossed it long ago. Welcome.) One can argue that horsehair lines cast so well that they really do perform better than mono or even fluorocarbon lines. It is hard to argue that a tippet of a single horsehair performs better than commercial tippet material. It is considerably weaker and considerably thicker. I am pretty sure you will hook more fish with a 5x nylon tippet. I am absolutely sure you’ll land more of the fish you hook if you use regular tippet. About the only things you can say in favor of the horsehair tippet are: (1) your rod will never break because you hook an unexpectedly large fish, (2) a line that tapers from 4 or 5 hairs down through three, then two and finally a single hair turns over wonderfully, (3) landing even modest fish becomes a challenge, (4) it will quickly correct any tendency you may have to strike too hard and (5) your tippets are completely biodegradable. I would suggest making the “tippet” in two sections, with one of two hairs and one of a single hair. To make the two-hair section, select two hairs that are smooth and do not have one end substantially thicker than the other. Tie the two together with an overhand knot. 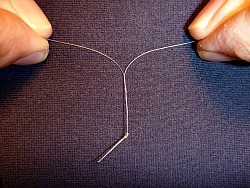 Grasp the individual hairs as shown in the photo to the right. With one hand, twist the hair in a clockwise direction and with the other hand in a counterclockwise direction. As you twist, move your hands closer together so the hairs can twist around each other. Reposition your hands after each twist. 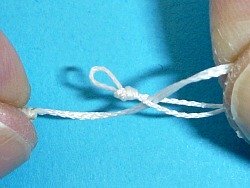 When you get to the end, tie it off with another overhand knot. For the one-hair section, tie the smoothest most perfect hair you can find to the two-hair snood with a double surgeon’s knot, glue and clip the tag ends. I tie the fly to the horsehair tippet with a Turle knot (not a double or improved Turle, but with Major Turle’s original). The Turle isn’t a great knot for mono or fluorocarbon, but works nicely with horsehair. The hair has a slightly rough surface so the knot won’t slip. If you are beyond obsessed, you will try tying flies to hooks snelled with horsehair. That is how it was done in the old days before hooks had eyes. It is quite doable but I find it quite difficult. You have to coil up the free end of the hair so it is at least somewhat out of the way when you wrap your hackle and body on the fly. An easier way, if you use eyed hooks, is to tie in the horsehair before you wrap the body, with the loose end extending over the hook bend. After wrapping the body of the fly, either overwrap or rib with the horsehair. Wrap past the hackle, trying not to mash any hackle fibers down. Wrap over the head and then thread the loose end of the hair through the hook eye from behind and underneath so it becomes your tippet. Put a drop of head cement on the hair on the “head” (before it goes through the eye). A horsehair overwrap makes the fly body translucent, and you should certainly hook fish with them. You should even be able to land the little ones. Overall the line is very nicely put together, and the taper is well designed -- the line turns over like a rocket without being too heavy. Chris' horsehair line only needs a gentle flick to completely unroll all the way to the fly. I found roll-casting in tight spaces to be fantastically easy, and normal tenkara casting to be a real pleasure.